Professional archaeological supplies since 1989 ! 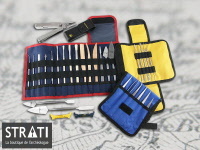 ...The basic tool kit...you need to become a professional archaeologist ! 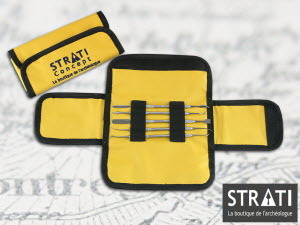 Nous avons composé des kits fouilleurs intéressants! Toutes les housses de rangement sont fabriquées exclusivement pour vous, archéologues, dans nos ateliers en Bretagne. This set contains 5 dental probes, which are adapted to archaeological needs. They are stored in a case especially developed for the use in the field. It can be easily opened and the tools are accessible. These pointed tools are well protected and prevent you from injury during their transport. Length: 15 cm, width: 5 cm. 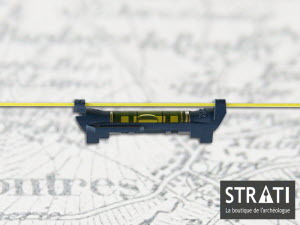 Very practical on the excavation, this spirit level can be hung on your stratigraphical cords as well as being placed on its four feet as an ordinary spirit level. With its simple pen clip, it is always in your pocket. Don't lend it to your colleagues, you will not get it back again!